Tonight marks four years that our dad left us for a more perfect world. I like to think that for him it is a world of Minnesota Twins, fresh corn on the cob, cabins, and bicycle rides. A world of gardens without weeds, autumns without winters, life without death. And certainly a world without car repairs. It is much easier for me to write about my dad's death than it was in the beginning. I will always miss my dad, but time, if nothing else, has the gracious power of healing wounds. Of taking away the sting. Of showing us the beauty that was there, even in the midst of the suffering. I couldn't see the silver linings then, not when it happened. I could only focus on the sorrow, the injustice, the pain. Now, four years later I look back on the days surrounding his death and funeral and can finally see some of that beauty. Beauty: My dad died the night of November 18. His obituary and his death certificate say November 19 because that is when his body was found. He went on a bike ride the evening of the 18th, like he frequently did. My mom went to a young women's activity. When she came home she noticed my dad wasn't home, but figured he had stopped to say hi to a neighbor, give a jug of apple juice, or do any of the countless things that would distract him from being home on a Wednesday night. She fell asleep on the rocking chair waiting for him, and when she woke up at 11 with my dad still not home, the panic set in. She called my brother who lived in Price and called a few neighbors. They went out searching for him. It was cold and it was dark. They searched and searched and searched. Besides my brother in Price, none of the other kids knew any of this was going on. My dad's body was found in a little ditch in the early hours of the morning of the 19th. His hands were still on the handlebars. He had a gash in his forehead, but there was not bleeding which would indicate that his blood had stopped circulating and he had died before the bike ever hit the ground. Cardiac arrest is the doctor's best explanation. He most likely died at the very beginning of his bike ride as he was only quarter of a mile or so from our home, probably around 5 or 6 in the evening. We know he didn't suffer through the cold night and that he was dead before anyone ever thought to wonder where he was. That night I was playing poker. A friend at BYU had invited me over for a Texas Hold Em tournament with just the guys. It was me and five boys. The buy in was $3. I'm not terrible at poker, but I certainly don't ever play the game planning on making money. That night I won. Easily, too. I got good hands, I bluffed like a pro, I fooled all those BYU frat boys. Five dudes and me and I took their money and beat them to pieces at their own game. My dad would sometimes tell us kids about his poker playing days. He'd tell us with a sly, mischievous grin, how he'd sit in the back of the bus and clean out all of his buddies. He was a good poker player in his day, one of the best, but shhhh don't tell mom. Mom would smile, she knew the man she had married, but feigned disapproval. Now that the pain has dulled I can think back to that night playing poker and feel my dad there with me. Helping me win those silly hands, perhaps? He had already passed on by the time I was enjoying a my poker night, and I like to think he lingered that night to watch, and maybe even help, his Bopper play a few hands. Beauty #2: I received the phone call around 7:30 am the morning of the 19th. I was already at school, doing my student teaching. When I heard the news I went in to tell my cooperating teacher that I would be going home, that I wouldn't be teaching that day- I had to leave right away. My cooperating teacher had lost his own dad at a young age and I will never forget that look of complete understanding and empathy he gave me when I told him. He knew the pain exactly, and he was so tender and sweet with me that morning and throughout the entirety of my student teaching. Another one: My home in Price was an hour and a half away from where I was going to school in Provo. I didn't have to make that drive alone. Two of my sisters and one brother lived in Provo. We made the drive down together. I sat in the backseat in the middle on the hump. The only time in my life where that crowded, squishy spot was the most wanted seat in the car, and I got it. Beauty #4: I remember so vividly approaching the front door to our house and seeing the sign "Give Thanks" on the door. It was a week before Thanksgiving, after all, and my mom had decorated the house with Thanksgiving gear. I remember feeling like that sign was mocking my pain, telling me to give thanks for the single most difficult experience of my life. Now I can look back tenderly at that sign. Thanksgiving had always been my dad's favorite holiday, and he had long taught his children about the holiday. I know all about how Lincoln first declared it a national holiday and how FDR later changed it from the last Thursday of the month to the fourth Thursday. I know all the history of that day because my dad absolutely loved the idea of a day to surround yourself with people and food and just be grateful. The sign wasn't mocking me, it was a sweet reminder of everything that my dad encompassed. A tender mercy, in fact. Beauty #5: The first person I saw when I entered the house was Chris Heiner, our neighbor down the street. She was sweeping the front entrance. She gave me a big hug and I don't remember if any words were spoken, but somehow I needed her to be there. She had long been friends with our family, both of my parents loved and respected her immensely. She was calm and collected, the perfect woman to be in my home. Beauty #6: Most of that day is a complete blur to me. I remember my mom huddled up in the rocking chair with a blanket over her. I remember so many people coming and going. I remember endless amounts of food that nobody wanted to eat. I remember a flower truck making constant deliveries. One of my favorite things I remember, though is my my mom's best friend's son. He had to be in his late 20s or 30s at the time. He was a grown man presumably with a grown job and grown responsibilities. I don't know that I had ever said two words to him in my whole life. Yet he was there all day long. Through the tearful morning, through the long afternoon hours. He was always nearby, but never saying anything at all. I remember sitting at the table and watching him play cards with my nephew. For hours, just he and my nephew playing with a deck of cards. What a weird thing to bring comfort to someone, I think, but it unmistakably helped me in those most difficult hours. Life is busy, people had excuses to not be there, but not this man. He was there all day long. A beautiful silver lining on that day. One last one: There are eight kids in my family. Six were living in Utah at the time. My sister flew in the next day from Virginia. My brother and his family, however, were living in India, and I remember how anxious I felt for him to get there, to make our family complete- or at least as complete as it could be now. It wasn't until more than 48 hours later that he walked in the door with his pregnant wife and two boys, weary and travel ridden. I remember how we all cried when we saw my brother, the new oldest male in our family. I will never forget his lanky body walking through that front door and how my mom hugged him and the rest of the family crowded him, united in our pain. With him there it finally felt like we had permission to mourn. I have said that I can see my dad in the shadows in my life. That I hear him in the quiet evenings when I'm writing, or when I see the red fall leaves in all their splendor. I feel him when I'm at his cabin, early in the morning making french toast or late at night looking at the stars. Sometimes I hear his quiet laugh when I'm teaching. I can almost always hear him expressing appreciation for good food and good people when I'm seated at the table with my mom and siblings. What I didn't realize until recently was that my dad didn't wait to come to me, to be a part of my life after his death. I had thought I needed to wait to have him close to me again, that I couldn't feel his presence with me until months after his passing, but that wasn't true at all. He was in the shadows of my life immediately after he died- instantaneously, in fact. He was there that actual night helping me play poker, that next morning through a sign on our door and a neighbor sweeping our floor, two days later when my last family member made it home safely to be with us and we embraced in the hallway. As soon as my dad left this earth he was with me. I guess the most beautiful beauty of them all, then, is that he never left at all. So beautiful, Bonnie. Thanks for telling your story. This is so beautiful. I could barely read it through my years though. You are such an awesome person. Thanks for sharing this. So moving. You're so gifted at expressing such complex emotions. Completely amazingly beautifully written. Thanks for telling your story and your remembered sorrow. Such a sweet well-written post. The kind of words put together so well your eyes brim with tears. Hugs to you Bon. Thanks, Bonnie. I'm smiling through my tears. I love you. I lost my dad almost 10 years ago now, and it does get easier with time... but it also never gets easier. I think that only makes sense to those who have lost someone close to them. I appreciate your optimism and ability to find the silver linings. The anniversary of my own dad's death is coming up soon and this is a positive and powerful example for me to remember and emulate. Thanks you. Bonnie, you are such a good writer. I'm glad that you can see the silver linings… we have so much to be grateful for… he is gone but he left such a great legacy. AND by the way, I flew in from Virginia, not California and it was on the 20th. I heard the news the morning of the 19th and we flew out the next day, the 20th. P.S. I love the poker story, never had heard that! He was totally helping you out! Oh, shoot I got my details mixed up. I'll fix it! I lost my Dad a few weeks after my 16th birthday and I had to grow up so much so quickly. Took me a while to allow myself to grieve and just as Autumn says, it does and doesn't get easier. The silver lining out of it though... It's made some of our family get closer. Planning my wedding can be quite hard when I stop and think that he's not going to be there, but the moment I tried my wedding dress on... I couldn't help but smile through my tears. I could picture him smiling. Pride and love showing in his eyes. It's 10 years in January, so it will be difficult but I'll make sure to remember this post and think more positive. When you post about your Dad, I can hear the love through your words and oh it's great. Thank you Bonnie! I sit with my coffee and cry with you, for you, for me, for anyone who was blessed and lucky enough to have a Father who loved us completely and even beyond. I feel the same way about my Dad. It is now 12 years and the reality is still "unreal" to us all. I also come from a large family. My dad was the Glue...he was the Rock...and how I secretly wish I could run to him and hide against him and his strong arms that held me so tight. I love this post. The cycle of grieving is different for each of us. I do believe time makes it "bearable"...but as you and I know...they are never ever unforgettable. Hugs! I think this is the most beautiful post I have ever read. Thank you for sharing. Bon. Such beautiful things that you have found since last seeing your sweet dad. I relate so much to you on this subject as I lost my dad too. I had a post speaking to my heart recently and wrote about how when my bestfriend passed away about a year after my dad, his mom showed me a note that my dad had written to him years before and at the bottom it said "P.S- I will repay you for making my daughter smile so big and have the best night of her life some how some way and it will be my pleasure when that time comes". The peace that I felt after reading that note and knowing the two of them were there together is one of the things that makes each day easier. I always tell people that every morning when I wake up, my heart and mind make up their mind on what kind of day they are going to have. I think it's safe to say from your posts about him that your dad was an unbelievable guy and I know that his favorite legacy would be all of the sweet kids he left here that are changing the world one high school kid at a time. Beautiful post Bonnie. Your emotions just come shining through. You are an incredible writer! I feel my dad, too. All kinds of times during my weeks. I started running because he couldn't even move after the cancer took over his body and I wanted to use my ability to honor him. I always feel him strongly when I'm pushing myself. I even smelled him very particularly right before I took off for the last race I was in. I love reading your posts about your Dad. Even though they make me cry every time. It never dawned on me how similar our Dads are. But now I look back and it's pretty obvious! They have a lot of the same interests! I can remember stopping at your parents house either on our way to, or on our way home from Emery... I think we stopped every time. I don't think we ever went inside when we first got there, we would run down the side of the house straight to the trampoline. Uncle Dennis was usually in his garden (where my Dad spends most of his free time) and we would jump on the tramp while our Dad's would talk about the different vegetables and see how well they were growing. I ALWAYS remember those two out there. Eventually we would make it inside to say hi to your mom and play some ping pong. We never wanted to leave your house. Thanks for sharing your stories, they really are quite special to read. Love you! Beautiful, brought me to tears. I lost my dad, too, and miss him very much. I can't even imagine. I am so glad you are able to find the blessings among the sad memories. :) Thinking of you lady! What is it about Fathers that make their daughters' lives so whole. I am so, so sorry for your loss. I rue the day that my own father passes. He is a part of me, so strong and fervent, and I've driven myself to tears at least ten times over the course of my life thinking about him away from me - and he's healthy as an ox with nary a health-scare in his life! It's the knowledge that the things and people we love can be snatched from us in an instant. Something that I heard at a recent funeral sticks with me: God doesn't take people away from Earth. He accepts them into Heaven. Remembering that fact, that Earth is but a gateway for Heaven, helps me through the grief of loss. Maybe it will help others here. Thank you for this post. You are so talented. This is beautiful, you are such an amazing writer. Thanks for sharing, I'll be thinking of you and your family today! This is beautiful Bonnie, and brought tears to my eyes. Being able to see the silver lining is an amazing gift. I lost my dad to congestive heart failure,5 years ago. I have always wanted to write a post like this one. This was beautiful and brought sweet tears to my eyes, what a great way to memorialize your father. This is a beautiful way to remember him and the tough time, I barely got through it without crying. Beautiful. Thank you for sharing your story. Bonnie, this was perfect. Every word is perfection. I love these posts about your dad. But in a way maybe your dad was teaching another lesson about Thanksgiving. That you will always be grateful for things that are lost, but that you can have again one day! Thank goodness for such an amazing life that we get to live, knowing we can see our loved ones again. Thank you for this post. It certainly touched my heart! I'm getting all choked up and am so, so, so sorry for your loss - but truly, Bonnie, this is one of the most beautiful pieces of writing I've read. Your father must have been a most spectacular man and he must indeed be with you all every moment of every day. Prayers for you & yours on this difficult day! I will have lost my mom five years ago later this week, also unexpectedly, so your words touch home. Thank you so much for the reminder to look for those tender mercies, to see that they aren't truly gone and that even in our pain, we are still loved and cared for. Beautiful Tribute to your father! Bonnie, this is such a beautiful post. Your posts about your dad always make me cry because I can see the pain but also the beauty, the silver linings. Over the weekend I went to a funeral for my friend's grandpa, and someone got up and gave a little analogy I don't think I'd ever heard before. He compared death to someone standing on the shoreline watching a sailboat sail away. They keep watching until it's a speck in the distance and eventually completely gone from sight. But it's being gone from sight doesn't make it any less real. There's someone on the other side watching the sailboat get closer, saying, "Look who's coming." I really liked that. You have such a way with words. Thank you for sharing what was/is such a hard time in your life in such a beautiful way. I'm sure your father is constantly smiling down on you. Thank you for sharing your memories of your dad with us. You write beautifully and this is such a great post. I'm sure your dad is proud to have such an amazing woman for a daughter. You're amazing, Bon. I had no idea you lost your dad. And that very thought scares me so extremely bad. You're definitely an inspiration that I look up to. To see the good things in the bad things. You're amazing. This gave me chills. So beautiful. This was an absolutely amazing and beautiful post. You forgot one important beauty: You. Bonnie. For writing this post, for sharing these feelings and for creating such a beautiful memorandum for your wonderful father. So many sweet words. Thank you for sharing. Jen (above comment) kinda took the words right out of my mouth. I am so sorry you had to go through this but am happy for you with the beauty you are able to take from it. My dad and I sound a lot like how you and your dad were, and posts like this always make me cherish him all the more. Sending prayers your way and hopes you get to dream with him very soon! this is absolutely amazing. you're words and the way you wrote them had me reading with wide eyes. i am so sorry for your loss but i am so glad you have found the beauty in it all. for me, it really makes me cherish the people i have in my life and remain thankful every time i get to spend time with them. thank you for this. Bonnie you are so gifted in expressing the feelings so many of us can't seem to put into words. You have such a beautiful way with words. Thank you for sharing this. You are the most amazing, inspiring, beautiful writer. This whole post had me bawling. Thank you so much for sharing such a personal part of you. It is a gift I can't even describe. What a nice tribute to your dad. My own father passed away 7 years ago and to this day, it's still hard to get a grasp of that. Until very recently, I have started to accept my father's death. 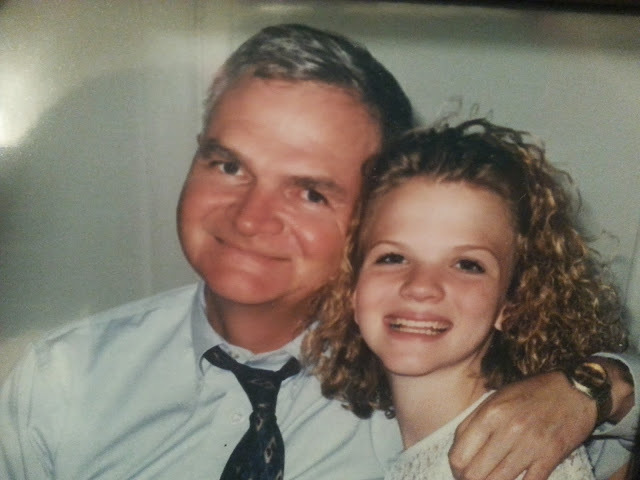 I was in my early 30's when I lost my father, even at my age I was still a huge daddy's girl. Seems like everyday I always have something that will remind me of my beloved father. Fathers are the best.